This is a scarce 1956 U.S. Air Force aeronautical chart or map of the northeast coast of Brazil. It focuses on Cape Sao Roque, on the northeastern tip of Brazil, and its vicinity from Recife north as far as Fortaleza and inland as far as Juazeiro do Norte. The cities of Joao Pessoa, Natal, Mossoro, Campina Grande, etc. are noted. 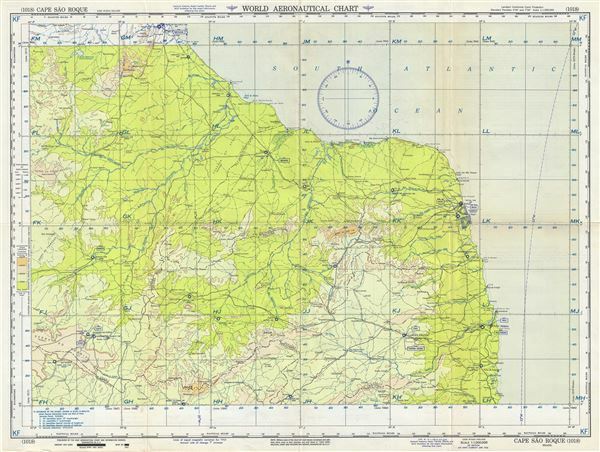 The map is highly detailed and notes several rivers, towns, lakes, villages and other hydrographical and topographical features essential for the air pilot. Verso of this chart features legends and a world aeronautical chart index. This chart was published by the USAF Aeronautical Chart and Information Service, and was issued as chart no. 1018. First issued in 1947, this is the fifth edition revised to April 1956.